Today’s leg of the A2B Journey continued southeast past the very sparsely populated west end of Dolan Springs, Arizona. Then, the route took a dog leg turn heading northeast towards the Grand Canyon. 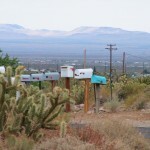 Before long, I began to see homes and neighborhoods as I got closer to the Dolan Springs city center. I spent most of the holidays in a different time zone and, like many, with a cold. I am over the cold, but the cough has decided to linger longer. Bottom line is that my body is still all out of sorts. Since I am not naturally waking up at my normal early time, I set my alarm. I wanted to get a long run in before the main events of the day began. After protesting the bitter transition from delightful dreams to reality, I began to stretch the stiffness out of my legs. Then, putting on weather-appropriate running gear, I grabbed a bottle of water and headed out. I started out easy to let my muscles loosen up and to let my lungs adjust to the cold air. Because of overnight rain and the early hour, I was alone for most of the run. I decided to run without music for a while. It was quiet . . . . I enjoyed this time. I could hear my body and thoughts more clearly. Oddly, the only distraction came during a short stretch of heavy, urgent traffic by a church. Congregation members hurriedly made their way to early services. I was happy to yield. With about a mile to go, I picked up my pace a bit. Then again in the last quarter mile. One of the lasting effects of the cold is long rounds of heavy coughing at the end of each run! This morning was no different. The post-run cool down and stretch was hindered for about 10 minutes. Throughout the run, my thoughts were dominated by something that my friend, Marnie Pehrson, said yesterday. Creativity is the gateway to the Divine! I believe this is absolutely true. Likewise, I believe creativity is in every single person! Creativity is something I have thought a lot about over the past two years. Everyone probably has a different definition for the word. As for me, creativity means tapping into the gifts that each of us have always had, seemingly since before our birth. Those things that make each person uniquely beautiful as she or he expresses and magnifies them. Ones Divine heritage, if you will. So it follows that creativity IS the gateway to the Divine. It is the fulfillment the very things each of us were designed to be and to do. Creativity cannot occur in a vacuum. By its nature, creativity is shared, enriching lives wherever it falls. It has the power to lift, strengthen, inspire, and, perhaps most importantly, add beauty. It this way, it is exponential. I love seeing and encouraging this in my children and others that I am close to. I believe that as they do, it makes them more beautiful! For most of my life, I did not see myself as having any creativity to speak of. I considered myself to be strictly analytical. Fortunately, experience encouraged me to look again and to look further. Since then, so many things have come to light. To start with, there is music. I hear music in my head all of the time. I always have. My dreams always have a soundtrack. When I was 9 or 10, I made up notation to write a different (aka “better”) arrangement for a song that I heard on a Saturday morning cartoon. I could hear the entire new arrangement in my head. It would be another 35 years before I put the pieces together and combine it with conviction. I guess there is a little creativity swimming around this head of mine after all. I am thankful to my friend, Marnie, for sharing a thought that consumed my run this morning and that led me straight to my piano afterwards. I love this concept… creativity blesses all it touches. I’ve been realizing lately as I’m trying to create my life’s work in a grander way, that I cannot create it in a vacuum. I’m experiencing creation like I never have before as I partner with others in collaborative synergy. Think about it, in the the most creative relationship two people can share, 1+1 isn’t 2, it’s 3,4,5,6, or more. As you said, creativity is exponential. Taking that collaborative synergy into all aspects of life (like entrepreneurship, causes, ministries or movements) creates remarkable outcomes that we could never create alone. Good stuff! Thanks so much for sharing! PS… I’d love to hear some of your music sometime! Have you recorded any of it?